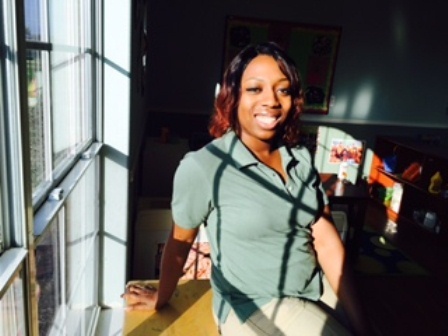 Meet Ms. Kiera, the talented school-age team lead at our location in Mansfield, TX! She has been at The Children’s Courtyard for five years, has a bachelor’s degree and is starting a master’s degree program in the fall for advanced curriculum and instruction. Check out our Q&A with Ms. Kiera to learn more about her! Why did you decide to teach in early education? I’ve always known that I wanted to help kids. I feel like they’re the foundation for our future. If I can change at least one kid’s life, then I’ve done something right with my job. How is it rewarding for you to work with the school-agers? It’s very rewarding. I feel great talking to them and mentoring them. They trust me, and that makes me feel great. You’re in the middle of summer camp right now – can you talk about some of the field trips that the school-agers get to go on? Their favorite one was Six Flags. We also did another really cool one, we went to the Fort Worth Log Cabin Village. They talked about the 1700s and 1800s and these log cabins people lived in. The kids, they really enjoyed that. They asked some really great questions. We also go to the nature park and do some outdoor stuff. They really like it. What are some benefits of our before- and after-school program? One benefit is that they do get to get physical exercise. I know a lot of them, they get home and it’s dark outside. And it’s not like when we were young and could go outside freely. Now it’s like, if your parents aren’t outside watching you – and some parents don’t have time to do that – then they can’t really go outside. Another one is the social skills. There are some kids who start here and don’t talk to anybody. They’re scared. I push them to go talk and two weeks later they’re a completely different child than before. Can you share a memorable moment you’ve had at The Children’s Courtyard? When I was teacher of the year! That was last year. I’m a zumba instructor! I actually teach it here, too, and the kids love it. Overall, how would you describe the past five years you’ve spent here with us? Aside from having a great team and coworkers, the kids are really great. You have good and bad days, but I tell people, no matter how tough my day might have been, it’s always ending on a good note, because at the end of the day, they’re kids. They’re fun and they always make me smile.